When you are planning your wedding there are so many moving parts to have come together and it is often the first huge event you have organized in your life. It can be overwhelming and I often see the brides beauty routine being left as a last minute consideration. Girl you are the star of the show! When you are planning your wedding and upcoming honeymoon trip you have to be organized with all your beauty treatments. That way I know if you are headed for the beach with your bikini or to Iceland and a fur lined parka. Because we have to plan those tan lines accordingly! I always recommend Airbbnb to my clients. It’s my Go-To for my get aways. There are really great places to rent all over the world and the the renter and homeowner are both checked so you can feel comfortable renting through the service. 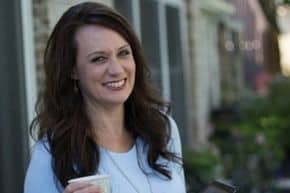 New to Airbnb? Great! I was able to get you $40 toward your first trip for signing up through my link. Now that you have your plans in place on to getting you all bronzed up and ready to leave on your trip. Now we need to plan out what wedding makeup and beauty services you want for your wedding day. So now that you know what the options are, now you need to know which ones you are interested in, who are the bridal experts in your area and how far in advance to book them. This is a hotly discussed topic amongst bridal beauty service providers. Unfortunately many of the BIG wedding planning websites recommend as little as 3-4 months from your wedding date for booking. This could NOT be more wrong!!! Did you know that we are booking in some cases over a year out? Especially if you are trying to assemble the top beauty team in your area. I have a hard time getting into my regular hair stylist unless I prebook my appointments. There is NO WAY that I will be getting in for a wedding cut/color and “day of” up-do if I call her 3 months out to book. If your wedding is in the spring or fall timeline which is wedding busy season please also know that Spring Break, Prom, Charity Galas and Homecoming are coinciding with this time of year as well. All of these events are vacation or dress up related and people are trying to get beautiful along with all of our brides. To be able to get the perfect professional and the time that YOU want for your special day please please please book as far in advance as humanly possible. There are going to be professional hair, makeup and spray tan artists that specialize in bridal beauty. As well as all of the other services that I listed above there are always the “go to” people in each city or town that are amazing at what they do and have perfected their artistry or service. This is your wedding. It will be heavily photographed with YOU as the star of the show. Do a little research to find out who the BEST are in your area for each beauty or personal service category that you are interested in having participate in creating your wedding look. Just know that often the best of the best fly under the radar because they receive most of their customers by personal referral from other wedding professionals so you may not see them advertising in the wedding guides or at the big wedding vendor shows because they don’t need to. You will have to ask around to find them. Now let’s get on to organizing your appointments!! When getting yourself ready for your wedding and honeymoon there is a special order to the beauty treatments that need to happen. One thing to consider is that for your spray tan and makeup application your skin needs to be in the best shape it can be in. Starting early with the proper skin care products and facial routine is going to make a HUGE difference in how your skin looks when you get to the big day. Get with your skin care professional early and find the right products for you and your body so that you have a customized product line that works for you. And because spray tans are what I do I need you to know that your spray tan is LAST!! Think of your tan as the icing on the cake, the absolute last stop on the train to wedded beauty bliss. The reason everything else needs to happen BEFORE your spray tan is so that the other treatments don’t remove or fade out your tan after I apply it. This ensures that your pretty tan stays just as you want it, on your skin for your wedding and honeymoon. Check out my post on when to schedule your mani/pedi for more details on not ruining your airbrush tan. Speaking of ruining your bridal spray tan let’s talk about washing your face AFTER I spray you for your wedding. Washing your face after your spray tan needs to be done gently. Especially if this is your wedding spray tan. Please don’t use harsh products. Please don’t use acne washes or spot treatments on your sunless tan. Please don’t scrub your face with facial wipes that contain exfoliators and chemicals. DO USE a mild cream cleanser that is for sensitive skin to wash your face with GENTLY. This ensures that your airbrush spray tan on your face has made it to the wedding day intact and that your makeup artist isn’t having to repair damage before she starts applying your makeup. Let’s break this beauty timeline down into manageable chunks so all your appointments are made in the right order and early enough in the game that you get the A-Team for your wedding day. He popped the question, you said YES and now you are planning your wedding! Step one choose and book your wedding venue so you have a confirmed date. All your future bookings for wedding related professionals hinge off this date and if they have it available for you to put them on your list for consideration. You may call and find that your top beauty professional is already booked and you have to move on to the next person in line on your list that is available. Pro Tip: it’s ALWAYS ok to ask if a vendor is available even if you don’t have the recommended lead time. You never know when another bride may have to cancel creating an opening and some professionals run on a cancellation list. If you are leaving for your honeymoon directly after the wedding you need to have your bag packed with TSA friendly beauty products that will protect your spray tan and keep that just married wedding glow. Pro Tip: tell your spray tan artist what the cut of your swimsuit is so she doesn’t make funny tan lines that might show on the beach. 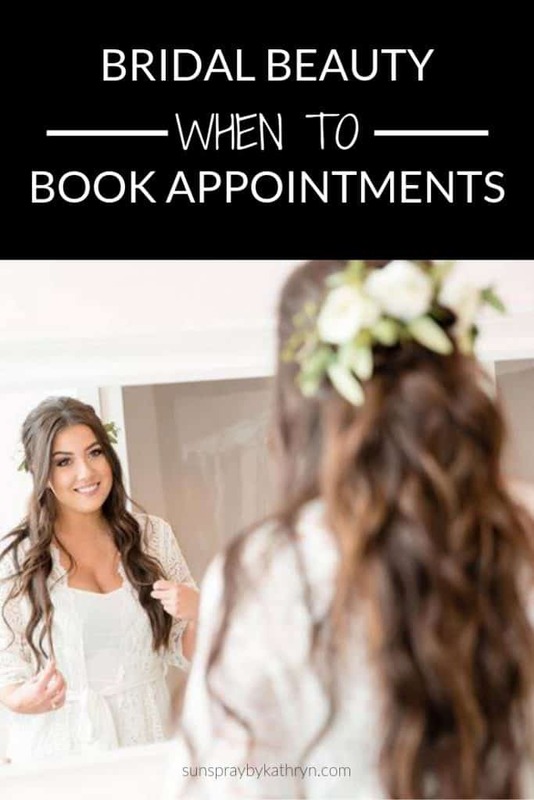 Scheduling your bridal beauty appointments early in your wedding planning takes a TON of pressure off of you and ensures that you get the beauty vendor that you love as well as the time that you prefer! Click here to find out how to book your spray tan appointment.